The European debt crisis raises many issues. In 2007, just before the financial crisis, European debt levels were relatively low by historical standards. Irish government debt was very low at around 27% of GDP. Spain was around 37% of GDP. UK debt was just over 40% of GDP. Clearly in the case of Greece, debt was already very high before the onset of the crisis (over 100% of GDP) . This gave them much less room for manoeuvre when tax revenues fell during the recession. 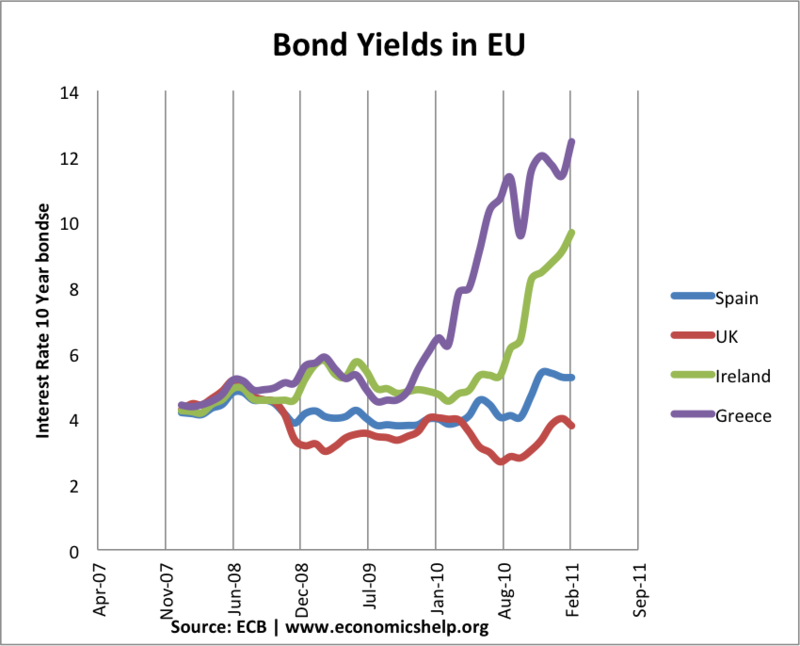 An indication of the debt crisis is a rise in bond yields. Higher bond yields are an indicator that private investors are unwilling to hold those bonds. If you don’t trust a country to repay you, then you don’t want to buy the bonds unless you get a higher bond yield to compensate for the higher risk. Greece has witnessed a rapid rise in bond yields as private investors have largely shunned Greek bonds on fears of the Greek government eventually defaulting. 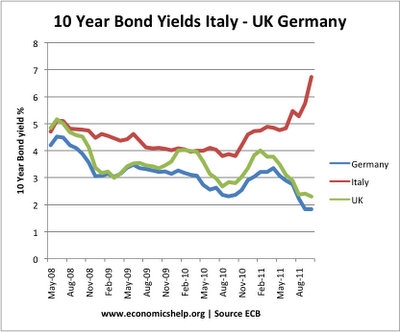 An interesting fact is that bond yields on UK debt have stayed low. 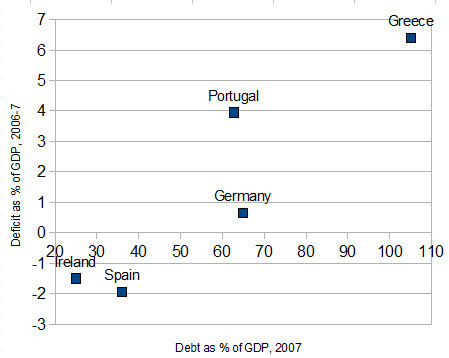 (it is the same in US where bond yields have stayed low) despite similar debt levels to Spain. 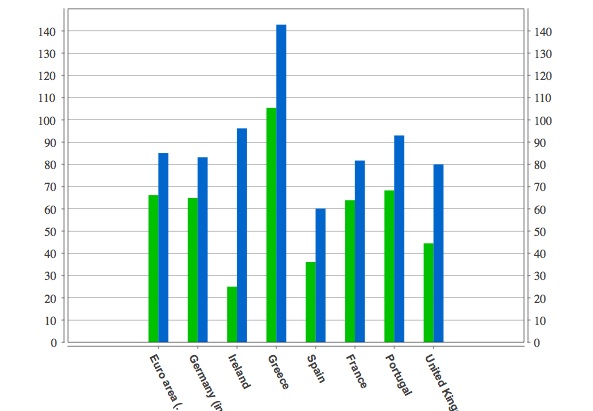 So far Greece, Ireland and Portugal have sought an EU led debt bailout. This involves commitment to reducing deficit with additional loans to help buy bonds. Because of the crisis, Greece has seen its credit rating downgraded to B- by Standard & Poor. Ireland has credit rating of BBB (see: Irish Credit Rating) Spain has a credit rating of AA2 from Moody. UK has so far retained its credit rating. Recession. In recession tax revenues fall, and governments spend more on unemployment benefits, therefore the deficit rises increasing total debt levels. Sluggish Growth. Countries with sluggish growth forecasts worried bond markets because with low growth prospects it becomes difficult to pay back the debt. Housing Slump. Countries like Spain and Ireland are facing a prolonged slump in house prices. This is exacerbating bank losses and diminishing prospect for growth. Tight Monetary Policy. Many of the peripheral EU countries lack the ability to devalue their currency because they are in the Euro. Therefore to regain competitiveness there is a need to pursue deflationary policies (cutting wages e.t.c) This damages growth and makes bonds less attractive. Will debt crisis spread to UK? ← When Does Keynesian Economics Work? But sometimes I was struggling to understand some economic terms or theories on your articles, for example, I still didn’t understand bond yield after reading your articles. Could you please expand them a bit more?